Recently we launched Devi HandLooms Story. You can find how we do, how we work for sarees. how we do traditional weaving, starching saree. we introduced new techniques while weaving warp and weft threads. We reduced threads overlapping small error while weaving. 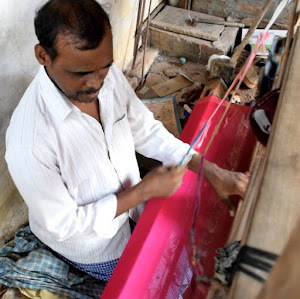 Currently we are weaving on Mangalagiri dress materials, which have unique zari borders like small with temple design, few of design have big zari border. We are doing special care on Dupattas to produce more simple and unique design patterns. We ensure that each and every Dress material design should not be last year or old designs. so people can expect new and fresh designs from Devi HandLooms. Mangalagiri Dress materials available from next coming weeks of Feb 2016. We starting working on Mangalagiri silk saree for coming days. you can expect these saree from June 2016. Significantly we are introducing new designs and color patterns for running saree as well pallu. Overtaking the challenges which is not possible in traditional handlooms.